Basil Cinnamon Ocimum Basilicum is an annual herb that can be easily grown from basil seeds. 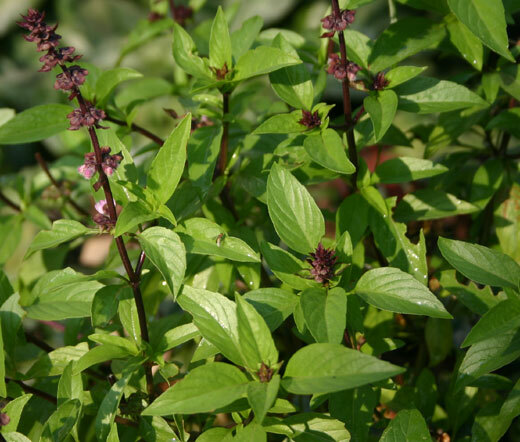 Cinnamon Basil features distinctive, sturdy, dark-purple, red stems with dark-green, small to medium-sized, cinnamon scented leaves and produces fragrant, purple flower spikes. Basil Cinnamon blooms in summer, and its attractive foliage and fragrant flowers draw bees and butterflies to a herb garden. Basil Cinnamon is grown as an ornamental herb in a garden. Other garden applications for growing Cinnamon Basil are baskets and containers, or this herb can be used as a companion plant to repel aphids, mites, and tomato hornworms. Ocimum Basilicum seeds germinate fast, and they can be started indoors or outdoors. Basil grows best in a sunny location and moist, rich, well drained soil. Cinnamon Basil is one of the favorite culinary herbs, and in addition to being used in all foods where basil has an impact, Basil Cinnamon is delightful as a tea or potpourri. The sweet flavor is excellent combined with other fruity flavored herbs such as Italian Basil.